This non-profit organization is dedicated to helping Clark County develop landscape designs that are both beautiful and beneficial to wildlife. They have 10 demonstration gardens for the public to visit. Volunteers also teach a Student Garden Coordinator series where CASEE students learn plant propagation, landscape maintenance and composting. CASEE student collecting freshly sifted compost. 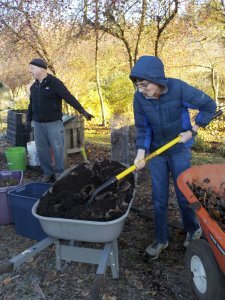 An extension of Clark County Health Services, this group of passionate individuals teaches CASEE students and Clark County citizens how to reduce waste by composting their organic garbage. They also maintain a demonstration site on the CASEE campus. A community service dedicated to helping land owners develop environmentally conscious strategies to manager their properties. 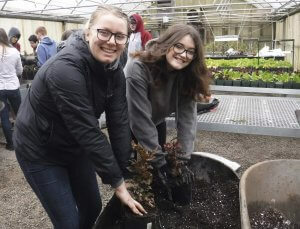 In addition to coordinating Envirothon competitions the Conservation District makes an annual donation of bare root plants to CASEE’s fundraising plant sale. Students potting bare root plants for CASEE’s fundraising plant sale. One of the leadership qualities that CASEE promotes in their students is being a good steward of the environment. Waste Connections provides waste management education to CASEE students to ensure they have the information they need to set a good example in their homes and community.